Designed to work with Cuno™, Everpure™ and BevGuard™ filter cartridges. 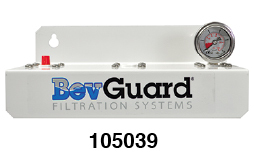 The BevGuard filter-head and manifold-head assemblies offer simple-to-use, industrial grade filtration solutions when high-use or high-flow is needed. Multiple coffee machines, beverage fountains and commercial Ice Machines can be supplied crystal clear filtered water by choosing the system that fits your needs. The plumbed-in-parallel multiple head design can give 2, 3, or up to 4 times the GPM flow rate of the individual cartridge rating being used. The multi-head assemblies can also have a 2nd separate polyphosphate head outlet for Ice machines or other equipment that need to be protected from scale.